To prepare for an accreditation process, the U-M College of Pharmacy wanted to create more competitive graduates. To achieve this goal, they reformatted their curriculum to focus on critical thinking and problem solving, as well as building the skills to encourage lifelong learning. 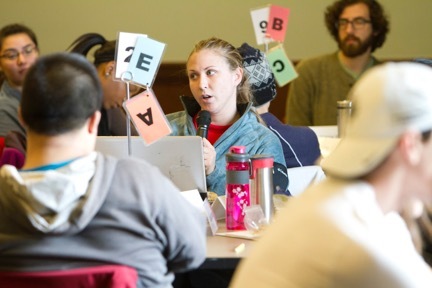 Faculty were encouraged to “flip” their classrooms, and move away from primarily lecturing, where students work through self-study materials before class meetings, and work through team modules and assessments in the class meeting. This Team-Based Learning (TBL) approach was adopted after much discussion across the entire five course sequence. Students complete preparatory work for a module before class and then complete an Individual Readiness Assurance Test (IRAT) consisting of 5-20 multiple choice questions. They then take the same test as a team (TRAT), with both scores counting towards their grade. The rest of the class session includes corrective instruction to clear up common points of confusion, and contains exercises to help students apply and extend the knowledge, working as a team to arrive at the “best” solution for a problem or challenge. Initially, finding the ideal self-study materials was challenging; what was imagined as 90 minutes of work was initially taking students up to seven hours to complete. By making sure that the content was carefully chosen and appropriate to the credit hours of the course, the time taken to complete the work became more reasonable.. Course coordinators ensured consistency across the sequence by reviewing materials and giving feedback. 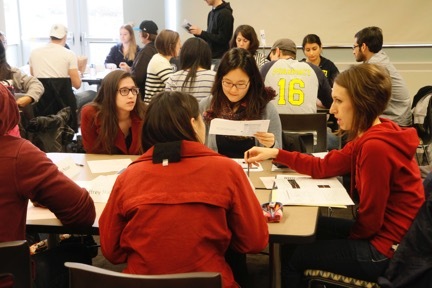 In order to support this shift in pedagogy across the department, faculty development was offered ranging from pedagogy workshops to CRLT-facilitated Midterm Student Feedback sessions. Administrative support was crucial as faculty transitioned to a new way of structuring and teaching their courses. Because of the timing of the curriculum overhaul, the College was able to directly compare students educated under the traditional lecture model and students who were taught in the TBL model. Although they had fewer overall clinical experiences and basic science courses, the students who had gone through the TBL sequence performed as well as students who were part of the traditional curriculum, even though the latter had an additional year of experiences on exams focused on application and synthesis. Further, TBL-educated students performed better on tests and reported higher confidence in providing recommendations regarding drug therapy.